ST. AUGUSTINE, FL, December 13, 2018 /24-7PressRelease/ — On November 17th the 2018 holiday season officially kicked off in St. Augustine with the annual Light Up! Night celebration in the Plaza de la Constitución across the street from one of the most romantic wedding venues in Florida, The Treasury on the Plaza. Every year, the nation’s oldest city is adorned with over two million twinkling white lights for Nights of Lights. This unique spectacle, which runs through February 3rd, has been named one of the top 5 places to see holiday lights in the world by National Geographic. The dreamy lighting displays spread across approximately 20 city blocks of historic downtown St. Augustine. From the grand facade of the Lightner Museum, to the iconic Bridge of Lions, and all of the quaint cobblestone streets in between, there is no shortage of picture-perfect locations. The glow of millions of white sparkling lights creates a dazzling backdrop for wedding portraits after the sun goes down. 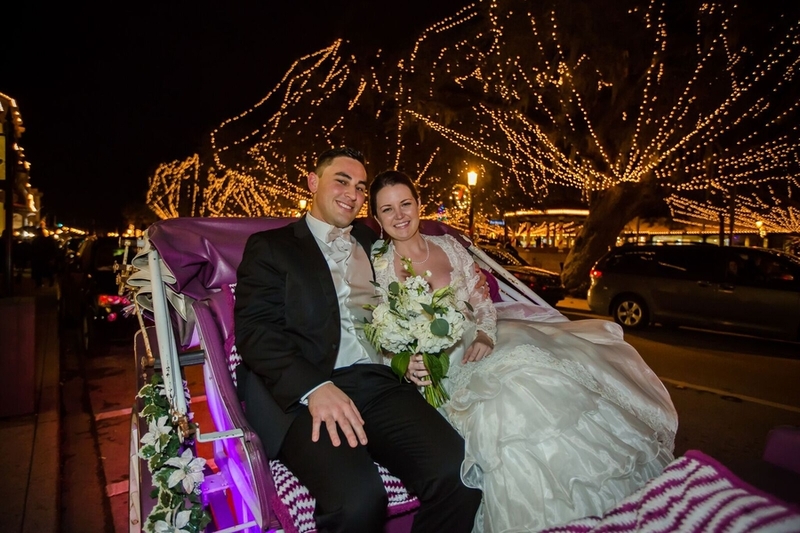 Carriage rides amidst the magical glow of the historic district make the perfect exit from your wedding reception, or even as a fun romantic outing while you are in town checking a few items off of your wedding planning to-do list. Reservations are available through Southern Carriages or Country Carriages. Are you looking for something fun and festive to do with your bridal party after your rehearsal dinner? Old TownTrolley’s famous Nights of Lights Tour promises caroling, complimentary hot cider, and homemade cookies! Ripley’s Big Red Christmas Train also offers a Nights of Lights Tour with a VIP option to book in advance and skip long lines. The reflection of the twinkling lights off of the water along the Matanzas River creates a dreamy sense of romance. A local favorite, the Schooner Freedom offers private charters for pre- and post-wedding get-togethers. Florida Water Tours offers private tours for 14+ guests with catering available. Many of St. Augustine’s local bars and restaurants get in on the festive holiday spirit for Nights of Lights. Nights of Pints, a bar-hopping special event offered by four St. Augustine breweries, makes the perfect post-wedding or bachelor/bachelorette party activity for beer lovers. For those who prefer a delicious martini, bayfront cocktail bar Tini Martini Bar has one of the most spectacular lighting displays in the downtown area. Looking for the perfect restaurant to host a pre- or post-wedding meal? The Columbia, The Bayview Room at A1A Ale Works, Harry’s Seafood, and Michael’s Tasting Room are located right in the downtown historic district. Whether you are hosting a wedding or just looking for a little holiday magic, Nights of Lights is a can’t miss event. We hope that you have the opportunity to come and enjoy the beauty of the nation’s oldest city during this special time of year! The Treasury on the Plaza is Florida’s most romantic wedding venue. The venue is located in St. Augustine’s first and only skyscraper in St. Augustine’s downtown historic district. The building is listed on The National Register of Historic Places in honor of both its architectural and historical significance to Northeast Florida.